It provides a rapid and efficient way of converting a manufacturing process from running the current product to running the next product. This rapid changeover is key to reducing production lot sizes and thereby improving flow. Let’s just think of it as reducing setup times and making the manufacturing environment more flexible so it can rapidly change from doing one thing to the next. SMED is a particularly important concept for High-Mix + Low-Volume Shops, which is what most Job Shops are. They don’t stay set up for long periods of time making the same part day after the day. They have to be able to switch things up as new orders come in for new parts. 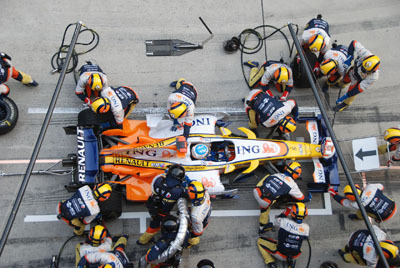 The classic example to visualize SMED is the racing pit stop. Imagine how long it takes you to change a tire on your car versus how long it takes during a racing pit stop to change all the tires, refuel, make adjustments, and so on. 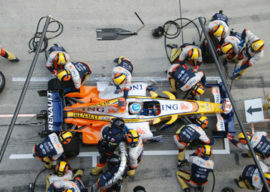 The pit stop is so much faster because they’ve geared up to optimize it. The same can be done for setup and job changeover. The SMED concept was first employed at Toyota to reduce changeover time for dies stamping out autobodies (hence the “SMED” name for what applies to a lot more than just Die Stamping operations). Before SMED, it required as much as 3 days to change the line to stamp out body panels for a different car. After SMED it was possible to do it in an hour and a half. This resulted in great savings for Toyota, and the rest, as they say, is history. A) Ensure that external setup actions are performed while the machine is still running. B) Separate external and internal setup actions, ensure that the parts all function and implement efficient ways of transporting the die and other parts. C) Convert internal setup actions to external. D) Improve all setup actions. Internal activities are those that require the process to be stopped before they can be performed. External activities can be performed while the process continues running. After running the 4 phases, one typically iterates through them again multiple times until there are no more improvements to make. – Retrieval of parts, tools, or materials. Make sure these are all being done while the machine is running. The machine should never be waiting on this kind of thing. – Eliminate search and find work. This is where starting with a successful 5S program really helps! – Preparation of parts and tooling in advance. For example, relocate them close to the machine or load them onto a pallet. Or start getting things in order for the next job before the current one finishes. Load up that cart with a job kit for the next job and assemble all the setup sheets and other documentation needed for that next job. – Eliminate adjustments where possible. For example, by use of stops and fixturing. Find ways to eliminate trial runs and any kind of trial and error adjustment. Another type of adjustment is the need to constantly inspect for tolerances and adjust via wear offsets. This can be automated using in-process probing. – Eliminate motion. For example, by reorganizing the workspace. – Eliminate waiting. For example, by coordinating the prior inputs to this process. – Standardize. For example, to minimize the tools that are needed or that are specialized between jobs. – Mechanize or Automate. Since this is one of the most expensive to implement, it is viewed as a last resort if other steps don’t achieve the goals. In general, the human factors should be addressed first and full scale automation last. Clearly SMED is concerned with eliminating waste just like all the other Lean Concepts. SMED is ideal when preceeded with a 5S program because the 5S program eliminates a lot of the waste SMED would target right away. Kaizen also goes well with SMED. One way to think about SMED is that it is a Kaizen Blitz aimed at reducing the waste of setting up for a new job. One can follow the Kaizen techniques with a SMED focus and it works well. For goal setting purposes, a successful SMED Event should reduce changeover or setup time by 50% or more. Reductions in walking time, kitting of jobs so that a single trolley can be quickly assembled and rolled over to set up the machine, proper documentation, good work cell layout, and similar factors all go to reducing the human costs. Don’t overlook proper documentation as a way to reduce human factors. Good checklists and setup sheets will save the operator time during job changeover. The world of fixtures, workholding, and a great many of the accessories available for CNC machines are focused on time and waste savings that are useful for SMED. Fixtures that use pins, cams, quick releases, pneumatics, and the like to replace tighting nuts and bolts are a great example. Another way to approach it would be the use of pneumatic socket drivers where bolts are required. Usually, having a well situated hand knob, lever, or toggle clamp will do the job well and inexpensively. 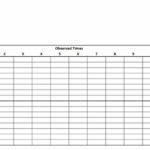 – Fixture plates that can precisely locate sub-fixtures very quickly to the machine table. Known work offsets can then be plugged in and the new job is ready to go in 10 minutes or less. – Pallet setups can be automated so a pallet is setup while another is being machined and then they swap. – It comes after all other SMED efforts have been implemented and the cost of changeover is still too high. – It should begin with semi-automation that achieves 80% of the benefit for 20% of the cost. For example, install of an expensive robot to load a mill, converting fixtures and vises to pneumatic operation may save a lot of time at much lower costs. – Always do a cost-benefit plan for automation to establish whether it can be cost-effective enough to make a good investment. Once it becomes cheap to retool for a different job, many benefits are realized. – Work in Progress inventory and Lot Sizes can be reduced if the cost of setup is cheap enough. – Finished Goods inventory can be reduced if it is easy to tool up again for reorders. – Equipment Utilization goes up as we spend less time on Internal Activities that require the machine to be stopped. All of this leads to increased profitability for the business. 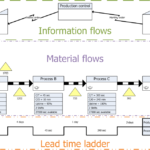 The next installment in our Lean Manufacturing Principles Series is about Kanban, which is a simple system for doing pull-based scheduling on the Shop Floor. 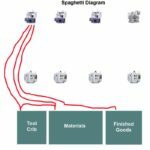 Bob – do you happen to know of any good online courses/resources that dig deeper into lean manufacturing and specifically implementing lean manufacturing in a high mix – low volume style shop? Michael, I am slated to do a post on high mix-low volume in 2 installments from now. I am doing Kanban next week and that one will come out the week after. In terms of getting more in-depth, I don’t have a course to recommend, sorry. I will be digging down on some of these topics further, and we have an unannounced product called G-Wizard ShopFloor that will also help you to implement these practices in your shop.